Sailor Moon's 20th Anniversary CD Review | The Gab Lab! The 20th Anniversary Sailor Moon CD has hit the shelves. All and all they clearly put some thought into it. The packaging is really something to look at. The cover is the same as the new manga so you’ve seen that already. It’s the CD in particular that is of note, quite pretty. Now I’m an old school fan. I cut my teeth on the language thanks to SM. The first Japanese song I ever learned was Eien No Melody back in what was probably 1997 or so. The first foreign CD I ever bought was the authentic sdtrk to the last season. Man was it expensive for poor student me at $32. In comparison you could get bootleg SonMay CDs for less than a third of that. I still have it too. Now on to my thoughts. I wrote these as each track came up. Moonlight Densetsu – Pretty darn decent. Clean music and Momoiro Clover Z is nice. The bridge at 1:32 is nice as it features some nice electric guitar. Heart Moving – Let’s go go 80’s dance club. I can’t hear the name of this song without the warm fuzzies of the ending animation sequence in my head. This is decidedly more beat driven now. It’s nice. Princess Moon – Starts out cute, like 50’s cute. Then the slightly off key singer kinda messes it up. Would be good for karaoke. Otome No Policy – Er, the singers sound like they trying to sing a gentle lullaby instead of a catchy song. The futuristic music sounds a lot like the music from the first and second Katamari Damacy games. La Soldier – Wow what a bitchin’ remake. You know it’s gonna be awesome when a song starts with thunder and a church organ. I feel like this should be playable on Rock Band. 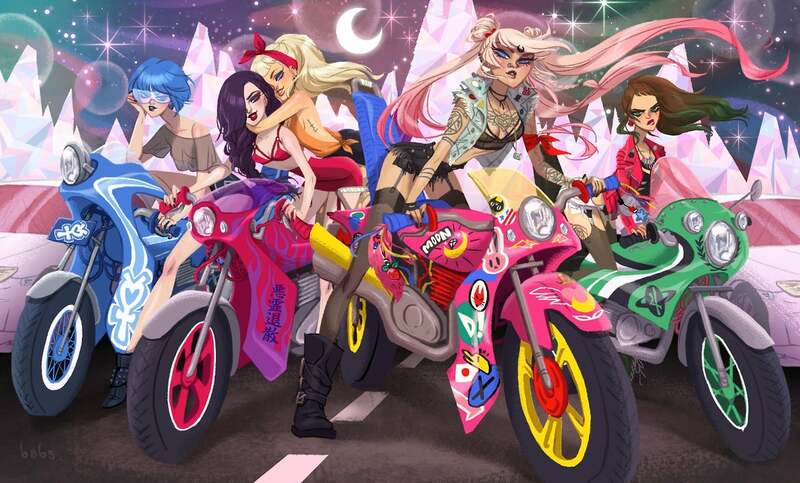 You know that art floating around with the senshi as a biker gang? This is their theme song clearly. Ai No Senshi – Starts off strong and then the girl singer sounds like a baby. Then what… a dude? Ok so are ChibiUsa and Tuxedo Mask singing this about Sailor Moon? It’s good music that needs slightly better singers. Tuxedo Mirage – This song is comparable to the original. The harmony sounds a little too manufactured though. Sounds like your typical lyrical j-pop slow song. Reminds me of purple, pink, stars, and love. Yeah I guess that’s Sailor Moon on the surface. Rashiku Ikimasho – I always thought of this as Ami’s song since it was in her special little movie. Upbeat j-pop again. It’s pretty good. Reminds me of the first one only polished up a little. Sailor Star Song – Starts beautiful and goes a little operatic. The singer (Sailor Galaxia of all people) warbles a little but it’s not that distracting but it doesn’t add anything. Good background, I bet this version would be great karaoke. Kaze Mo Sora Mo Kitto – Starts out sounding like Beck and then an immature voice ruins any cool this song may have had. It’s immediately better at 5:30 when she stops. I’m pretty sure I’d do a better job. ugh. You know, this may have been the song that should have had a male voice. On the fence about that…. Moonlight Densetsu (French ver) – Smooth. I kinda picture a smokey french nightclub and a lady in a classy but too tight red dress on the stage. It’s French, what else can I say? Best song? La Soldier by a MILE. Worst song? Kaze Mo Sora Mo Kitto. What were they thinking with that one? All in all, worth it even if it’s just to sing along. Don’t want to DL or buy it without hearing a little first? Here is the promo audio with snippets of each song. This entry was posted in Anime, Blog, Movies, TV, Celebrities, Music, Ѫ. Bookmark the permalink.